Special Life University Edition of the Neuropatholator is now available! Recently, Dr. Guy Riekeman (President of Life University) and Bruce Goldsmith (President of Visual Odyssey) have created a special edition of the Neuropatholator Software to provide compelling interactive content for educating Chiropractic Patients and their families. This software is now available for your practice. Not only will you get the 4 decade proven power of the Neuropatholator, which indelibly drives home the consequences of the subluxation, but you will also have at your fingertips a discussion of the vitalistic forces that help in the achievement of health. Over 50 topics, animations and videos are only one to 3 clicks away to help you cement a firm foundation of understanding. This deep comprehension leads to greater acceptance and follow-through. Ultimately, you will experience more referrals as a result. And the great news is that this patient-centered, custom-delivered and riveting presentation will be powerful and memorable while saving you time. 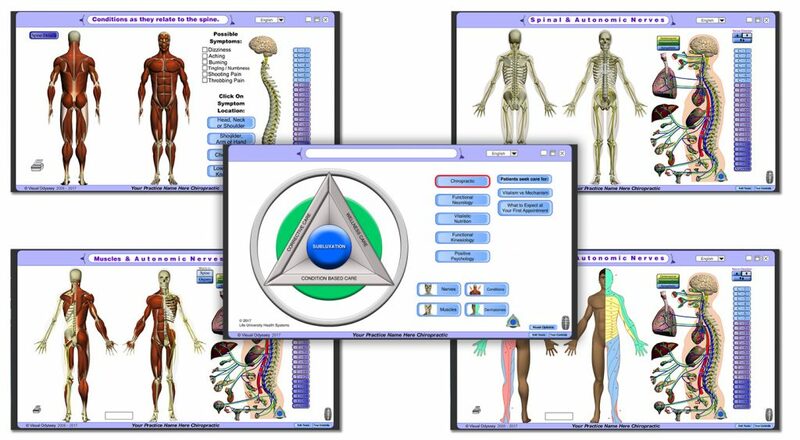 Some of those dramatic topics include the classic: Spine to Nerve, Organ, Muscle and Dermatomes; 3D Interactive Spinal Sections; Visual Demonstrations of Symptom Patterns as they relate back to the Spine; The Subluxation; Phases of Care and Phases of Degeneration; Recovery Timelines; Tissue Healing; Disc Problems and Decompression; Posture Deviations, including Forward Head Posture; and more. There are additional modules you can add for Health Talks, Ergonomic Workshops, and information aimed at engaging elementary school children and their parents. You can even add info on whiplash and extremity joint problems. 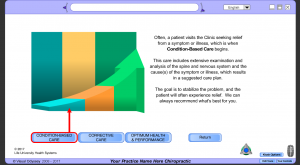 “The Neuropatholator software effortlessly increases my patient retention, and when I use it with patients who have been with me for 30 years, they are blown away because they now see the whole picture in a new way. How amazing is that? I love seeing the actual moment during the presentation when the light bulb turns on in their minds; when they first begin to see the value of correcting the source of the problem and understand the fallacy of chasing their pain and symptoms. Bruce has designed a powerful, cohesive message that illustrates better than any words can describe, and its impact on people is remarkable! You can now put a REAL ‘Speed of Click’ Neuropatholator on your computer or TV. Just imagine the power of a 40, 55 or even 70 inch Neuropatholator that instantly shows the consequences of a subluxation at any vertebral level. That’s right. If you have a computer or a large TV or monitor, you can turn it into a patient motivator just like the Neuropatholator Wall Chart for MUCH LESS -and- it does MUCH MORE. 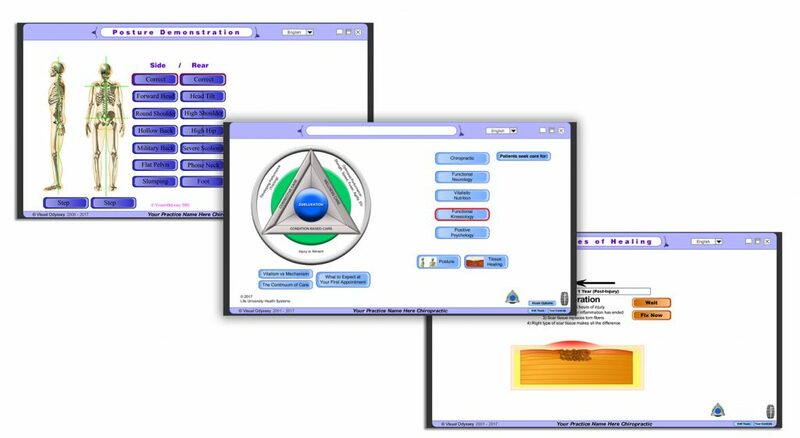 “The Neuropatholator software program graphics are both “simple” for patients to understand, yet “detailed” to fully compliment a doctor’s explanation on an array of conditions. We have used the program during our second visits, as well as new patient orientations. 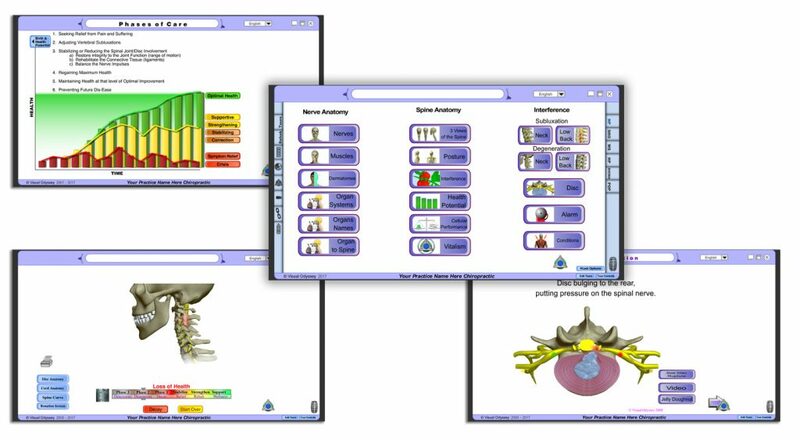 And when you get the new Life Edition of the Neuropatholator Software, Visual Odyssey donates 20% to Life University. You win, Your patients win, and Life University wins. Call 800-541-4449 to order today.